TRENTON, New Jersey, September 23, 2010 – Radioactive tritium that leaked from the Oyster Creek nuclear power plant in 2009 into two aquifers below the facility is being removed after months of delay, says the New Jersey Department of Environmental Protection. The Exelon Corporation, which owns and operates the power plant, has agreed to start pumping efforts this week on two monitoring wells in the Cape May and upper Cohansey aquifers, and also has agreed to expand that effort to a third contaminated location by early October. The goal is to remove the tritium-tainted water to avoid any potential contamination of drinking water supplies, said DEP Commissioner Bob Martin. At a meeting last week in Trenton with Commissioner Martin, company officials outlined plans to immediately start pulling contaminated water from the ground below the nuclear generating station to control any further migration of the tritium plume which is currently flowing uncontrolled towards the plant’s discharge canal. “We have asked Exelon to expedite this effort, to clean up this radioactive material as quickly and efficiently as possible to ensure public health and the safety of our drinking water supplies,” said Martin. 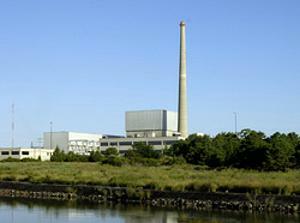 Oyster Creek, situated in Lacey Township, Ocean County, New Jersey, is the oldest operating nuclear power plant in the United States. The 619 MWe boiling water reactor plant first came online on December 1, 1969, and is licensed to operate until April 2029. Tritium occurs as a by-product of nuclear power plant operations, and tritium leaks are not uncommon at nuclear power plants nationwide. Martin said he is encouraged by the Exelon’s cooperation with the state in dealing with the tritium contamination issue, especially by the company’s willingness to expedite the cleanup process and explore remediation alternatives. But he also pledged that the DEP will carefully monitor the work to make sure it is done properly. In May, Martin announced the launch of a state investigation into the 2009 leak of radioactive tritium into the aquifers below Oyster Creek. The DEP issued a Spill Act directive to Exelon, requiring the plant owner to cooperate with the DEP’s investigation and take action to prevent the radioactive substance from ever reaching the region’s drinking water supplies. In June, Exelon documented levels of tritium in the monitoring wells located in the Cohansey aquifer that exceeded one million picuries per liter (pCi/L), as compared with an EPA health-based standard of 20,000 pCi/L. Exelon says those levels have since declined, but Martin says they are still above acceptable standards. Monitoring data shows nearly 700,000 picuries of tritium per liter at two locations in the Cohansey and Cape May aquifers. That contaminated water will be pumped into drums and transferred to a holding tank on site. Eventually it will be diluted into the large volumes of water used daily for cooling the power plant. The plant gets its cooling water from Barnegat Bay, a brackish estuary that empties into the Atlantic Ocean through the Barnegat Inlet. The dilution is expected to bring the tritium levels below detectable standards. This will be confirmed with surface water monitoring in the discharge canal, with the results to be shared with the public. The plan also calls for continued regular monitoring and analysis of the content of the water pulled from the ground, and careful observation of groundwater levels in the area near the nuclear plant. Preliminary results from groundwater monitoring wells to date indicate that tritium has not reached the clay bottom of the lower portion of the Cohansey aquifer and has not been detected in any of the wells in the even deeper Kirkwood aquifer. The tritium plume appears to be moving toward Oyster Creek’s discharge canal, but no samples taken from the discharge canal have indicated the presence of tritium. To avoid similar leaks, Exelon has said it will move all pipes handling radioactive water either above ground or into concrete vaults by the end of 2010, and says those upgrades are on track to be completed before the end of the year.